People in treatment for mental illnesses do not have a higher rate of violence than people without mental illnesses. Furthermore, depression affects one in 10 American adults, according to estimates from the Centers for Disease Control and Prevention. Pillorying depression is regressive, a swoop back into a period when any sign of mental illness was the basis for social exclusion. The Americans With Disabilities Act of 1990 prevents employers from discriminating against people who have a mental illness. If we defend the right of people with depression to work anywhere, shouldn’t we defend their right to enter the country? Enshrining prejudice in any part of society enables it in others. Most of the people who fought for the right of gay people to serve in the military did so not because they hoped to become gay soldiers themselves, but because any program of government-sanctioned prejudice undermined the dignity of all gay people. Similarly, this border policy is not only unfair to visitors, but also constitutes an affront to the millions of Americans who are grappling with mental-health challenges. 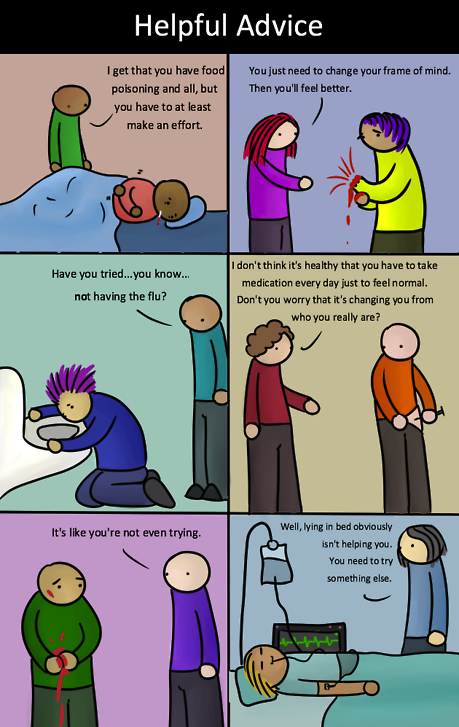 "mental illness." Society defines what is "healthy" or "ill."
self limiting labels. We act out what we think we are. I once told a group of people with borderline personality disorder that they had to decide for themselves if they were truly mentally ill. This was pushing the envelope a bit, and a psychiatrist thought I was completely off my rocker. Your comment though makes me think of the French resistance. There is no doubt in my mind that today’s psychologists would have identified any individuals who participated in a resistance or rebellion as antisocial or as having bpd. Psychologists have become far too concerned with making everyone cooperative and capitulant to the dominant way of thinking, and hey, who knows maybe it was comprised mostly of individuals who have bpd or aspd. It’s not to say these individuals might have not had problems in other areas of their lives, but maybe these personalities are just better suited for certain things. I think of my depression/anxiety as a neurological disorder just like Huntington's or Parkinson's. It has nothing to do with my personality or character, it's a biological malfunction that made me horrifically miserable that we thankfully have effective treatment for. Now that my symptoms are in full remission, I no longer have those diseases. Look, if you dont feel well, then ur sick. And if the tv is talking to you, then ya needs ta takes ya antipsychotics. Yes, but is psychopathy a mental illness? I realize psychopaths have a difficult time doing the right thing but they can do it. Yes, absolutely. As an analogy, if you threaten to punch someone with severe depression, they'll get out of bed, even though it's impossible for them under normal circumstances. People with more moderate mental illnesses can hide their deficits and hold down jobs and relationships for years while suffering immensely, until they use the last drop of willpower and collapse. Similarly, a psychopath can do the "right thing" once when threatened with immediate negative consequences, but it's impossible for them to do it every day for the rest of their lives due to well-documented differences in their genetics and brain function. But let's ignore the biology for a minute. If someone grew up with abusive parents with a limited social circle and reached age 18 without ever experiencing love or a sane system of consequences, how on earth do you expect them to figure it out on their own? Especially since lesson number one of their childhood is everyone puts on a facade? It's like expecting someone who's never seen a golf club to compete with Tiger Woods, and half the instructions you give them are lies. True, studies have found 10% of people can survive that situation and emerge as well-adjusted adults, but every single one of them had a caring adult who acted as a psuedo-parent. People have as much control over mastering skills they've never seen as they do over how much monoamine oxidase their brain produces, which is to say none. Like M.E. says, you have to teach psychopaths why they should do the "right thing" in terms that make sense to them. Soon they will implement fMRI's at airports to weed out the psychopaths, just because. I'd better go travel before that happens. What I have noticed is that while mental disorders and the like are becoming more known and understood, it doesn't mean people will accept and like the person for it. The airport incident just goes to show that in this day and age, everyone needs to wear a mask to avoid being ostracised & stigmatised for even the smallest dysfunctions. The biggest problem with profiling the mentally ill is you wind up focusing more on the suffering that comes in the aftermath of pathological thinking/behavior. The symptoms that we call pathological are the result of something else. The difficulty is in determining the original source that produced the suffering that manifests as symptoms. Many personality disordered individuals pride themselves on being very mentally sound because they do not suffer and remain consistent in their general attitudes. But their actions are at the root of the suffering of others. A classic example of this dynamic would be corporal punishment. Caregivers that use this method of discipline find it to be labor saving and effective. Those on the receiving end often suffer greatly. The "fault" for the suffering is the method that the caregiver uses, yet the child who has been harmed generally bears the stigma/ ill effects. To pathologies the child feels like victim blaming. The mentally ill get scapegoated for human interactions that often lie outside/beyond their control. As long as the victim gets blamed, the perpetrator can continue to benefit from actions that are harmful to others, and therefore have an incentive to place the responsibility for the pathology on the "broken" victim. Yes, “cure” is good if stupid self-absorbed people knew the difference between natural human variations and actual mental illness. I am becoming more and more aware that this blog is mainly catering to bunch of super empaths, who like to change everyone else. I really don’t like it, but I understand M.E needs to sell her books. So, she is serving her clients, who are 95% empaths, appropriately. Wrong, Wrong blog for my types! In your ideal blog, what does it contain and what would you prefer to be discussed? Are you malevolent by nature? Intellectually curious? (doesn't appear so) Want exploitive stories.tips from Socios? You already have a predetermined motive for this blog. I'm curious. Thanks for asking. No, I’m not malevolent. I might be a not-so-empathetic person, but I’m honest and up-front. I don’t set up candy store, but instead sell diet magazines. I don’t write entertaining books about less known/ possibly malevolent people, and lure people to my web site to give them some inside information, and meanwhile sell my books to them and make money. It’s just low, no thank you, I don’t need anymore “tips” . Is it possible that some of the empaths you reference are trying to get a handle on the sociopathic experience? And as for "curing" sociopaths- I haven't really seen evidence that the majority of commenters (at least regulars) are trying to do that. There's a difference between trying to fundamentally alter someone's nature and simply trying to understand what motivates them so when interacting with them you can structure your own behaviors to minimize alienation. Cooperation that is mutually beneficial is labor saving. Like it or not, identified sociopaths are marginalized by society so there's a fundamental tension between the empath and the sociopath that makes cooperation very difficult to achieve. Because the identified sociopath is different from the majority, they tend to get blamed for the breakdown of a relationship that is due to failures of understanding on both sides. I've often wondered if the sociopath's duplicity is as much an effect of being marginalized as being the cause. ME has created a community where truth about an experience can be discussed without the fear of retribution or stigma. But maybe that's not what you're looking for. I'm so impressed with your ability of direct communication. A definite strength of your's and other sociopaths. Something I am trying to learn, and that is modeled well on this site. The daily blog posts are informative and educational, and yes, help me to understand the relationship between socios and empaths much better. As well as...and most importantly to me and apparently you...improve living for all involved. It seems to me you are accomplishing your goal. This really is another great topic, ME. And I rarely, if ever, call anything great. She's definitely a sociopath, it's just the way that it is currently conceptualized by psychologists doesn't provide the full picture. It's much more complex than a lot of psychologists realize. I'm well aware of that, Ginger. I, too, am a psychologist, having been granted my degree from a very prestigious university. (I, however, do not have a need to throw the title of "doctor" around because I'm not a douche bag who is obsessed with what people think. And let's face it: we aren't "doctors". We're PhD's. But you're condescension is appreciated.) I specialize in diagnosis. I'd have to meet her in person to say for sure, but after watching her on YouTube with Dr. Phil, I'd say she's really more of a narcissist with insight. You must remember that one can be diagnosed on Axis II with one personality D/O and list traits of another. She's a narcissist with some antisocial traits. If you watch her and read her microfacial expressions, you might infer that she plays the part of calm well when angered or anxious and she's much more insecure than she lets on or will admit to. The part about the kitchen knives, for example, was a blatant lie but was used for the purpose of obviously selling her book but also as a way of seeking attention to inflate her ego. With Cluster B's, any attention-- even negative attention-- is good attention. And, no. I am not a sociopath. I may have some traits, but we ALL do. Wow you are absolutely repulsive. “I’m not a douchebag who is obsessed with what people think of me, but just so you KNOW, I went to a very prestigious university”…..”We’re not doctors, but we’re doctors”. Love it. Do you feel like the anonymity the internet provides helps protect you from the social consequences of abusive behavior? What’s your name? I’d love to know your name. She’s a narcissist with insight? It sounds like you are projecting your own biases and your own personal experiences on to her. How about removing your biases, and examining it from an objective perspective. Her description of the knives sounded like she was just trying to understand her disorder better. It’s not uncommon for people once they receive a diagnosis to begin attributing a lot of their behaviors to their pathology, accurate or not. They’re just trying to understand what’s normal and what’s abnormal. Some of them become a bit obsessive about it overanalyzing everything. "We're PhD's. But you're condescension is appreciated.)" You don't even know the difference between "your" and "you're" and you expect me to believe you have a phd? Just to add to my comment, I am "not" against psychology. I worked in a psych ward, I saw it all. I'm just open to alternatives.